The complete data solution for USVs. 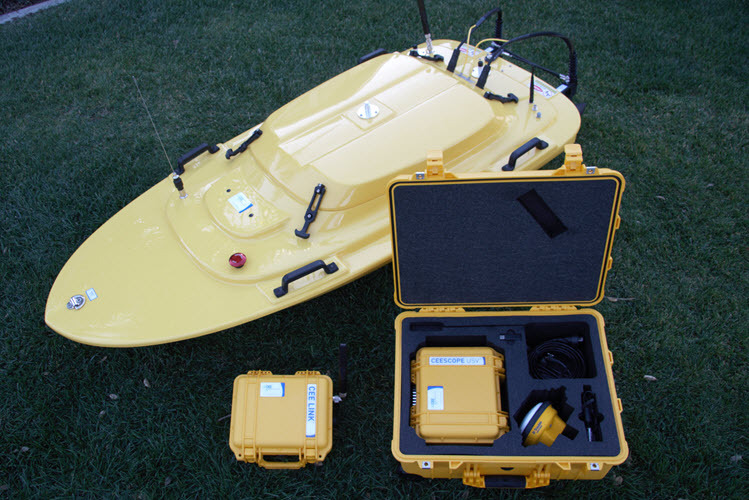 CEESCOPE-USV™ is a unique single or dual frequency hydrographic surveying system with GNSS positioning, echo sounding, data recording, and data telemetry in a single compact package for use on remotely-operated or autonomous survey boats. The CEESCOPE-USV™ is a complete single beam hydrographic survey, GNSS and data radio telemetry package that can be installed on practically any Unmanned Surface Vessel (USV) or remote controlled survey boat. As a self-contained system requiring no data interface with the vehicle, USV instrument integration challenges are completely eliminated, and the vehicle design requirements can be simplified, lowering the total system cost. Using real time broadband radio telemetry, the USV operator on shore can view all bathymetry data via the CEE LINK™ radio module, including third party data such as video and side scan imagery. The system can form the backbone of a remote hydrographic survey capability, with the reassurance that all of the components have already been tested and successfully used on USVs for several years. With rigorous handling of data timing and long range transmission with no interference issues, the echo sounder may be deployed on any vessel – from a surf board to a catamaran raft to a high power monohull. The CEESCOPE-USV™ may be used interchangeably on a remote vehicle or manned boat. Simply connect the acquisition PC to the CEESCOPE-USV™ directly by LAN cable or WiFi and perform traditional bathymetric surveys. 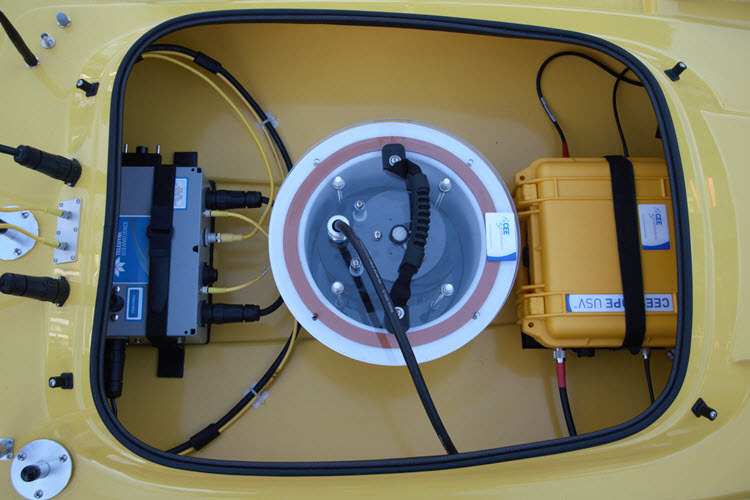 For use on a USV, instead connect the acquisition PC to the CEE LINK™ shore radio module that automatically receives data from the CEESCOPE-USV™ installed on the remote survey vehicle. 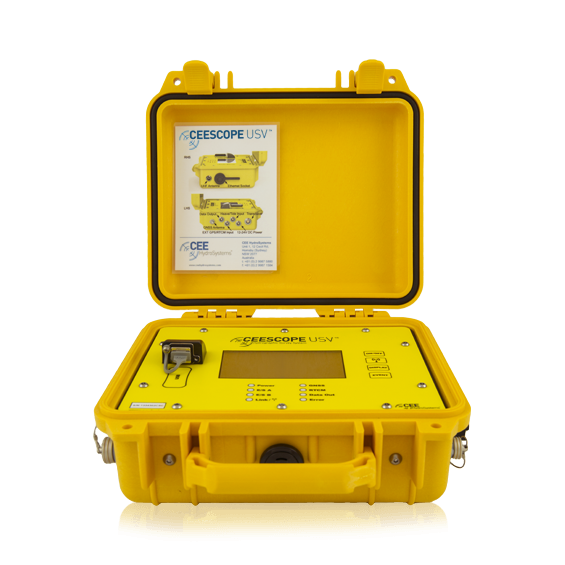 CEESCOPE-USV™ offers the same exceptional shallow water performance as the CEE ECHO™ and CEESCOPE™ echo sounders. With bottom tracking in as little as 15 cm (6″) of water, the system is ideal for inshore USV surveys in rivers and ponds where a high proportion of the survey area may be too shallow for a manned boat. In addition, the CEESCOPE-USV™ records and transmits a water column echogram to the acquisition PC, offering detailed surveys with accurate results even in challenging environments. The USV should be a survey tool and not a science project. Easy to integrate external GNSS. The CEESCOPE-USV™ will take in external position data with practically no changes in setup needed. High quality shallow water bathymetry data – critical for USV operation. The 200 kHz CEESCOPE-USV™ is able to maintain accurate bottom tracking in <15 cm (6″) water depth. The CEESCOPE-USV™ uses 1PPS GNSS time tags on all data collected, eliminating detrimental effects from radio transmission. The CEESCOPE-USV­™ design allows a greater safety factor for critical components, such as radio modules. UK-based Unmanned Survey Solutions (USS) use the CEESCOPE-USV™ on their single beam remotely-operated survey boat. The Inception vehicle design allows direct access to the echo sounder / data module allowing users to easily switch the payload between vessels. Inception is designed to carry single beam and multibeam echo sounders, and is fabricated entirely from Aluminum with robust field-exchangeable dual motors offering survey-grade ruggedness and durability. Learn how the CEESCOPE-USV™ was used to survey shallow regions of the major Italian port. Measuring sediment accumulation and water volumes in industrial holding ponds, tailings impoundments and effluent lagoons are ideal tasks for USV bathymetric systems such as the Inception. With no means to launch a manned boat into the pond but easy access for a portable USV, surveyors were able to get the job done safely and efficiently with minimal mobilization time. CEE HydroSystems USA has delivered specially modified Teledyne USVs that incorporate the CEESCOPE-USV™ in place of the factory (separate) echo sounder, GPS, and telemetry options. Instead of the various discrete components with their associated interconnections and communications settings, the CEESCOPE-USV™ puts everything in one portable, waterproof, and rugged enclosure for the ultimate single beam solution for this vehicle. Dual channel echo sounder, RTK GNSS receiver, UHF radio, data logger, data telemetry radio and external network data input: all in a single control unit. High power WiFi telemetry. 1000m range. Ethernet data / camera input for USV navigation. Internal data logger for standalone operation. Waterproof case for ultimate ruggedness. LCD touch screen for exceptional ease of use. 20 Hz ping rate for high quality survey results. 3200 samples high definition echogram. A key feature of the CEESCOPE-USV™ is its integrated data management and telemetry package that operates entirely separately from the remotely operated vehicle on which it is installed. The CEESCOPE-USV™ echo sounder is paired with one (or more) CEE LINK™ shore radio modules to allow the operator to communicate with the echo sounder and any connected instruments. Simply turn on the CEE LINK™ and communication is immediately established with the CEESCOPE-USV™ on the remote survey boat. The CEESCOPE-USV™ uses a 5.8 GHZ WiFi telemetry system to transmit survey data to the shore CEE LINK™ base station. 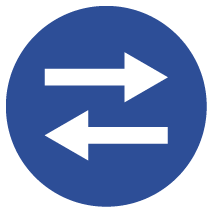 The telemetry link is two-way and acts just like an Ethernet LAN cable connection. The network connection allows the operator to remotely adjust echo sounder parameters or communicate with any ancillary equipment connected to the CEESCOPE-USV™ Ethernet data input port. The radio module may be turned off when the echo sounder is directly connected to an acquisition computer, saving battery life when in use as a conventional echo sounder. Interference-free operation – The data telemetry link will not interfere with standard 2.4 GHz FHSS remote-control boat systems. Auto-link operation – The CEESCOPE-USV™ and CEE LINK™ shore module automatically connect whenever powered-up and in range. Long range – 1km range using antennae suitable for small USVs. Network architecture – Other network-enabled devices such as an Ethernet camera may be connected to the CEESCOPE-USV™. Antenna flexibility – Use low-gain antennae for short range surveys and directional panel antennae for optimum performance at long range. High bandwidth – Offers substantial additional data telemetry capacity if needed, subject to appropriate antenna selection. Download the CEE-LINK™ shore radio module data sheet. External GNSS – All CEESCOPE-USV™ systems can take in external GNSS from a third party receiver. Using an external GNSS could not be easier; simply connect the Bluetooth data output to the CEESCOPE-USV™ and transmit wireless NMEA0183 messages for incorporation into the survey data. Alternatively, a serial cable connection may be used. Hemisphere Crescent Marine Beacon – Single frequency L1 GPS receiver for cost effective one-box surveying where differential corrections may be supplied by free SBAS systems such as WAAS or EGNOS. May also be used with MSK marine beacon corrections for a differential (DGPS) solution. NovAtel OEMStar – Single frequency L1 GNSS receiver with GLONASS satellite tracking offering a more robust solution where there may be partial obstruction of the sky, such as under tree canopy. NovAtel 628 – Multi frequency L1/L2/L5 GNSS receiver with L-Band corrections for up to 10 cm accuracy with a subscription corrections service. The L-band option is typically selected where free SBAS or beacon corrections are unavailable and it is not practical or necessary to set up a local RTK base station. NovAtel 628 RTK – Multi frequency L1/L2/L5 GNSS receiver with RTK, allowing the CEESCOPE™ to connect to a local RTK base station and receive real time kinematic differential corrections for cm-level precision. Typically selected when water surface elevation (tide) is being measured using the satellite positioning system and not traditional (eg tide gauge) methods. Trimble BD970 RTK – Multi frequency L1/L2/L5 GNSS receiver with RTK. For use when Trimble base station equipment is present. Will communicate with Trimble (or other manufacturer) base station broadcasting all formats of corrections including CMRx. Satel Radio – Built-in UHF radio system and external antenna. Connect to a local base station broadcasting on UHF 450-470 MHz avoiding the need to connect any external radio modem on the survey boat or USV. Airmar SS510: General purpose small 200 kHz transducer with 9 degree beam angle. Airmar M195: Compact survey grade dual frequency (33 / 200 kHz) transducer, with small size and low weight very beneficial for USV deployment. Will fit inside typical USV “moon pool” designed for <9″ diameter instruments, although the 33 kHz beam angle is relatively wide at 26 degrees. The 200 kHz has a standard 8 degree beam. CEE HydroSystems has several years experience using USVs for shallow water hydrographic surveys in Australia, Europe and the USA. We have worked with radio-controlled, manually navigated and autonomous (waypoint / line-following USV systems). We can offer insight into the key factors that determine a successful remotely-operated survey boat program for different types of environment, and also provide help for those planning to build a custom USV. If you are building a USV, please let us know; we can help with your data and telemetry challenges – leaving you more time to focus on the vehicle. CONTACT US Find out how we can simplify your survey vehicle project.